This post was written to directly stand against a letter recently published by the National Peanut Board (a real name that I did not make up). 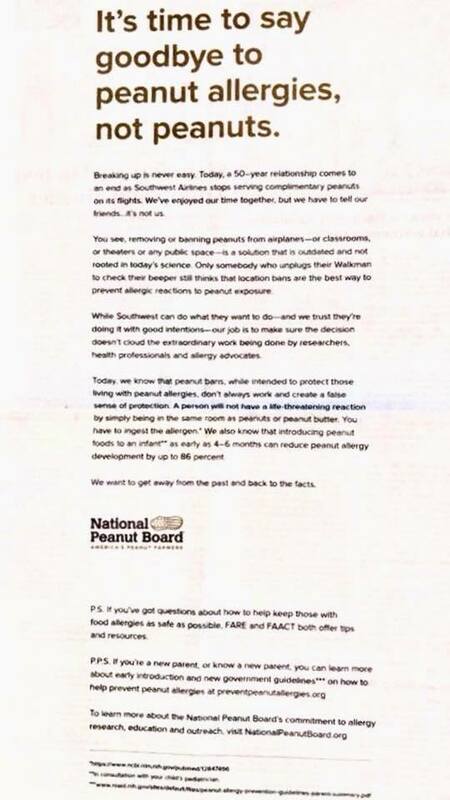 That letter can be viewed below and insists peanuts do not pose the risk many believe they do to allergic persons. I go through it line by line with the text from National Peanut Board prefaced with “Letter” and my thoughts prefaced with “My response.” As usual, sources are always cited. My response: Completely agree. Hooray! This guy for everything! My response: Hmmm. Well, that took a jarring turn pretty quickly. That’s like saying it’s time to say goodbye to lung cancer, not cigarettes. Letter: Breaking up is never easy. Today, a 50-year relationship comes to an end as Southwest Airlines stops serving complimentary peanuts on its flights. We’ve enjoyed our time together, but we have to tell our friends…it’s not us. My response: Relationship drama does not belong on social media. Ten points from Slytherin. Letter: You see, removing or banning peanuts from airplanes – or classrooms, or theaters or any public space – is a solution that is outdated and not rooted in today’s science. Letter: Only somebody who unplugs their Walkman to check their beeper still thinks that location bans are the best way to prevent allergic reactions to peanut exposure. My response: First of all, don’t hate. The 90’s weren’t that bad. My response: Secondly, location bans are one piece of a complicated system that peanut allergic people utilize to find safe spaces and keep themselves out of danger. Location bans especially make sense in venues where a person can’t just leave if they find themselves confronted by a dangerous allergen. Like, I don’t know, a metal tube hurtling through the sky at warp speed? Letter: While Southwest can do what they want to do – and we trust they’re doing it with good intentions – our job is to make sure the decision doesn’t cloud the extraordinary work being done by researchers, health professionals and allergy advocates. Letter: Today, we know that peanut bans, while intended to protect those living with peanut allergies, don’t always work and create a false sense of protection. My response: So because they don’t prevent every instance of peanut triggered anaphylaxis, we should just not have peanut bans anymore? Come on. Even the National Peanut Board has to realize how phenomenally asinine this statement is. My response: Let’s say you are driving in a car that has four windows. Suddenly, it begins to pour. The rear passenger side window isn’t going up for some reason. Are you not going to close the other three windows to afford yourself some protection from the rain? Because this press release says they would just never even touch a window button again because when three of the windows roll up, the driver feels a false sense of security from the rain. That is how stupid this is. My response: Anaphylaxis at school has become increasingly common. Letter: A person will not have a life-threatening reaction by simply being in the same room as peanuts or peanut butter. You have to ingest the allergen. My response: This is patently, verifiably false, and you should be ashamed of yourselves for saying it. You should be ashamed of OPENLY LYING about whether or not having peanuts nearby can kill someone. You should be ashamed that misinformation like this further endangers the lives of allergy patients around the world. You should be ashamed that an allergy patient might believe the words in this press release and injure themselves or worse. Where’s your false sense of security now? My response: The American Academy of Asthma, Allergy, and Immunology (AAAAI) and the American College of Allergy, Asthma & Immunology (ACAAI) sit on a joint task force together for the purpose of developing a robust set of medical guidelines to protect patients with allergies. AAAAI and ACAAI both acknowledge that anaphylaxis can occur without ingestion of the trigger. My response: Other groups also reported that anaphylaxis can occur without ingestion of the trigger. “Allergic reactions that result from direct skin contact with food allergens are generally less severe than reactions due to allergen ingestion. Reactions that result from inhalation of food allergens are generally less frequent and less severe than reactions caused by either direct skin contact or ingestion. Exceptions to these generalizations are more likely in occupational environments and other settings in which food allergen sensitization occurred via either inhalation or skin contact.” (Chapman 2006) Author’s note: Please note that this was not tested on mast cell patients so reaction severity may vary. My response: Anaphylaxis to peanut can be life threatening. Letter: We also know that introducing peanut foods to an infant as early as 4-6 months can reduce peanut allergy development by up to 86 percent. My response: YOU GUYS, I FOUND THE ONLY TRUE STATEMENT ABOUT PEANUT ALLERGIES IN THIS ENTIRE PRESS RELEASE. But don’t get too excited because this only pertains to IgE mediated allergies, traditional allergies. There are a number of food allergies that are not mediated by IgE. 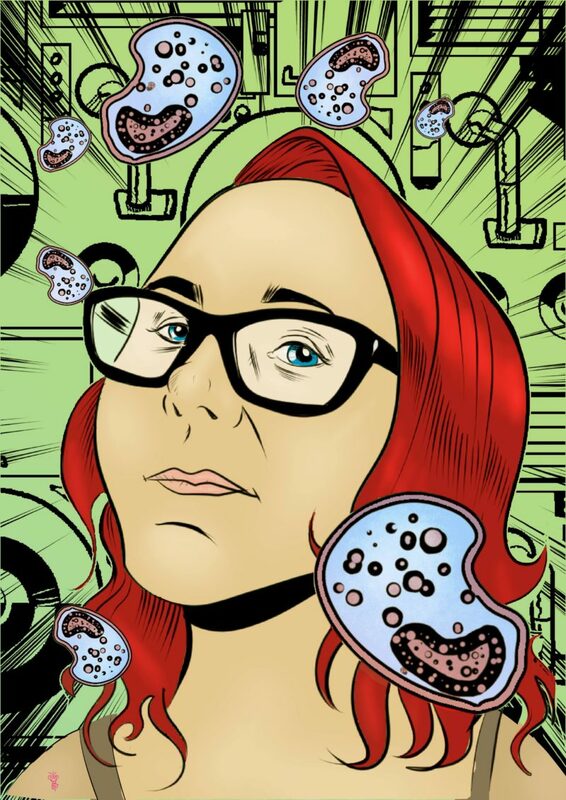 If you have mast cell disease or eosinophilic GI disease or FPIES, the age when you introduce a food isn’t the driving issue in whether or not you tolerate it. Chapman JA, et al. Food allergy: a practice parameter. Annals of Asthma, Allergy, and Immunology 2006;96:S1-S68. Lieberman P, et al. Anaphylaxis – a practice parameter update 2015. Ann Allergy Asthma Immunol 2015;115:341-384. Sampson HA, et al. Food allergy: A practice parameter. J Allergy Clin Immunol 2014;134:1016-1025. Sicherer SH, et al. Clinical Report Management of Food Allergy in the School Setting. Pediatrics 2010;126:1232-1239.